Almost every parent is curious about this question. To find out more about when do babies start teething and what should they do as a remedy to soothe them down, please browse through the article below! In Terms of Age When do babies start Teething? Babies usually start teething at the beginning of the 8th month. As per science, teething starts anytime between 7 to 12 months and it is normal for all babies. The lower front teeth grow first followed by upper front and by the time your baby attains the age of 3, it has nearly 20 primary teeth. 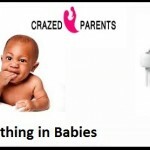 It has been observed that the teething pattern of a baby is similar to that of its parents. However, it might not be true all the time. 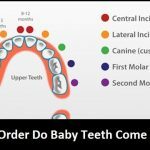 Below is the baby’s tooth timeline for all the curious parents out there with the following questions: when does a baby start teething or at what age do babies start teething. Naturally, babies get teeth in pairs, wherein initially the bottom middle two followed by upper middle two. And in rare cases, it could be reverse. Now that we have gone through the timelines, let’s have a look at some symptoms of teething that mostly all the babies show at some point of the teething cycle. Chomping : Once the baby starts teething, they feel like gnawing all the time. Hence, you can see your little bun relying on some or the other thing to chomp off often. The deed of chewing makes them feel comfortable during such weird sensations. Puffed gums : You can see your baby’s gums turn red, swollen and sore looking. It happens when a new tooth starts erupting from within the gums. Sometimes, you can see the gums bulge clearly with erupting tooth. Drooling : Though baby drools normally, there is some limit to spittle out. When you notice an excessive limit of drooling, it could be the sign of a new tooth peeking out. Fussiness : Your baby might undergo an intolerable irritation throughout the day as the tooth erupts from within the gums and the bones. During the night, your baby might feel more fussiness than during the daytime, so be ready to soothe it whenever needed. Ear pulling : Even adults feel ear pain when they have toothache! How can a baby not? Ear pulling is one of the common symptoms that partially answers the big questions- when do babies start teething. Though there are possibilities that your little one may get an ear infection, the pain from jaw (when a tooth erupts) will extend to the ear canal. Thus, pulling of the ears could be one of the teething symptoms. Intake disturbance : You can normally see a baby teething around the age of 6 months.So obviously, parents might start semi-solid & solid foods. Because of teeth irritation, babies might want a liquid diet like bottle feed or nursing as the spoon may hurt the inflamed gums.On the other side, babies who rely on nursing and formula milk when start teething might pull back where the action of sucking makes them feel painful. Thus, when you witness a change in your baby’s eating habits, just be sure how to handle the case and do not panic. Cleanliness is the first and foremost precaution to avoid any illness during the natural teething cycle. Hence thorough care and regular teeth cleaning and hygiene can help you in keeping it away from pain and discomfort. After teething, it is a must to finger daily, even after that tooth fall will happen. Thus regular dental cleaning and hygiene are very important as they will save your baby from tooth decay. Rinsing the baby’s mouth and cleaning its teeth after every meal is a very healthy habit. This practise will also help you save your baby from premature tooth decay. You can wipe your baby’s gums with a clean & gentle washcloth or you can use infant soft bristles to brush your baby – remember that water alone is enough and toothpaste is not required as this age. It can further harm the newly born teeth. In addition, do not allow your little one to sleep with feeding bottle. The milk or whatever you give in the bottle will pool the baby’s mouth leading to tooth decay and plaque formation. You can start using fluoride toothpaste content once your baby attains the age of 2 or 3, but that too only of small pea sized amount. A damp washcloth: Take a piece of a damp wash cloth, make one end wet and the other end dry to catch hold firmly. Just keep it on the popping gums wherein the chillness makes the baby feel better, you can also try giving teether that are refrigerated, but ensure that too much frozen / icy stuff may be too harsh to the baby’s soft gums. Soft massage (to the gums): If the gum bulges and the little pearl is not yet popped out, you can try massaging the gums softly, that will soothe the baby a lot indeed. Try soft rubbing also as a counter pressure action. Gentle massage (to the baby): Give your baby a gentle massage all over the body with lukewarm olive oil or baby massage oil. He/she will calm down for some time and will feel sleepy. Warm gentle bath: Give your baby a warm and gentle bath, where the splashing time could make your baby forgetting such irritating pain. Gnawing: If your baby is breastfeeding still, then be safe, wherein he/she will teethe on you. And so, give him/her a feeding bottle filled with normal water or warm water that your baby can gnaw on it. Refrigerating the toys: Pick all your baby’s soft toys and refrigerate them! The chillness will provide your baby numb effect so that teething pain disappears for some time. But do not forget to read over the toys handling methods on refrigerating or not. Alcohol away: Be a watchdog and do not allow alcohol to go near your baby. Even 0.5% in any solution can cause great harm during teething. Mesh feeder: Try giving your baby mesh feeder filled in with either cold banana or apple (be sure that it must not refrigerate), else you can use any other soft fruit to soothe teething pain. Friction: Try giving friction or counter pressure! Just wash your hands with a good hand wash and use your finger, palm area or knuckles to soothe the aching gums. The pressure will comfy the baby for some time. Highly important: Make sure that your hands & fingers are clean and germ-free. Mama’s chin: You can allow your baby to gnaw your chin part when your little bun is facing the teething sensation. Do not forget to wash your face before fetching your baby. Pain reliever: Lastly, you can try medication of a pain killing combination such as ibuprofen or acetaminophen, but it is advisable to go for doctor’s prescription. Mind distraction: Understand a common thing that is applicable even for us! When we are silent, naturally the concentration sits on one thing. Hence don’t allow your baby to be idle, just engage him/her with the introduction of new toys, new games and different deeds every now and then to distract his/her concentration. Thus by diverting away from one concentration, chances are there that he/she can forget the pain for some time. Amber: At home, you can take a necklace made up of amber and make your little one wear it. Natural amber has anti-inflammatory and anti-therapeutic properties, hence, when your baby chuckles it, it will soothe him/her. Wipe your baby’s face often with sanitized wet wipes to escape him/her from drooling and to avoid developing rashes. Keep your little one engaged with something he can chew on. Chomping off unnecessary things can prove dangerous and can lead to diarrhea. Use soft rubber teething products which are chilled. Try giving him/her teething biscuits which will provide relief from pain and discomfort. Don’t ever try giving your baby any set of medication without doctor’s supervision. Don’t tie the teething ring around your baby’s neck as it may lead to strangling and choking. Don’t give teething gels and tablets as they are not really recommended by the doctors. Please don’t use any set of alcohol such as brandy or something else to rub the baby’s gums , as it can prove highly dangerous for the newborn. Now since you know when do babies start teething, don’t just sit there, waiting for your baby to start the teething cycle. There’s so much information that you can find here which can answer all your questions. Keep reading and sharing! I’m actually teething right now. My wisdom tooth is growing and it hurts like hell. Some of the points here are applicable to me. I think I might buy a pain reliever. I used to wait for my babies to start teething.. It’s like finally, the teeth pops out… Around 1 years old.. Thanks for the information, its great to know all this even before we have children to get us prepared. It seemed like a lifetime ago when my little man’s first tooth erupts, but it is probably sometime when he was 8 months old. It was both an exciting and challenging time for both babies and new mums. Some tooth eruptions are accompanied by fever, so it is a must to distinguish the signs at once and make the little ones comfortable while teething. «Next Post How to Make a Baby Stop Crying ?